A group of campaigners formed a human chain along a busy cycle lane in London calling for safer bike lanes. They lined Penton Street's cycle lane and applauded cyclists as they rode past during the morning rush hour. Organisers said the "human-protected" cycle lane was to promote safety for all road users. Images from the campaign were shared on Twitter with the hashtag #MakeTheLane. Caroline Russell, a Green Party member of the London Assembly who is also an Islington councillor, told the BBC the chain brought "a lot of joy" to other cyclists. Ms Russell said she had had "many frightening experiences" on her bike: "The line was about standing there with our fragile bodies protecting fellow cyclists," she explained. She added that the only negative response to the human chain came from "a community bus driver" who "started shouting at people to get off the road". 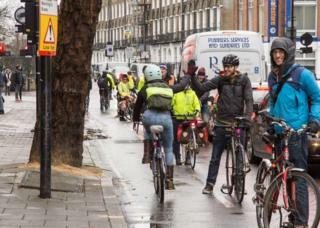 The campaign's organiser Sean told the BBC why Penton Street in Islington was chosen: "It is a good example of a location where despite larger numbers of people using bicycles there is not a safe protected route." "Paint provides no protection and road layouts encourage faster driving," he added. Around the world campaigners have used human chains to highlight the issue. Earlier this year, a "human barrier" of bike riders protected a cycle lane in Andrew Street, Dublin to prevent drivers from parking illegally. In the US, after the death of a 24-year-old woman involved in a cycling accident, the cycle lane in Spruce Street, Philadelphia was protected by a chain of activists in November to promote safer bike lanes.